DUBLIN CITY COUNCIL moved one step closer to rescinding Aung San Suu Kyi’s Freedom of The City after a committee established exactly how it could be done. The procedure was thrashed out by councillors at a protocol committee meeting this morning and it will go before the city council for approval at the next council meeting on December 4. If, as is expected, the procedure is accepted then councillors will then vote on whether Suu Kyi should be expunged from the honour roll later that day. The issue made headlines earlier this month after Bob Geldof announced that he is returning his award because he did not wish to be included on the roll alongside Suu Kyi who he described as “one of the great ethnic cleansers of our planet”. The Myanmar leader, who won the Nobel Peace Prize in 1991, has been criticised at length for her inaction amid abuses in her country against the Rohingya people. Up to half a million Rohingya muslims have been fleeing to Bangladesh amid a military crackdown in Myanmar. Councillor Deirdre Heney, who chaired the protocol committee, said she believes her fellow councillors will likely vote to take the honour from both Suu Kyi and Geldof. “If someone wants to give it back I think they should be allowed. You can’t give someone something they don’t want,” she said regarding the Boom Town Rats frontman. Heney said she would abstain from both votes out of regard for the process undertaken by the Lord Mayor of the day. My own view is that we hand it out too much. I think it should be reserved for very, very, rare occasions and for people from our own nation. It lessens the value when you hand it out too often. “If anything I think this will have the positive effect of focusing minds on who it is awarded to,” the North Central area councillor concluded. At this morning’s meeting councillors were advised that they did not need additional powers in order to remove a name from the roll of honour and, in fact, it had been done before. The case in question involved German scholar Kuno Meyer. Meyer was a leading expert on Celtic studies who published numerous texts and translations of ancient Irish writing and poetry. Douglas Hyde described him as “one of the most lovable men who ever existed, and himself undoubtedly in love with Ireland”. Dr Meyer was awarded the Keys of the City in 1912 only to have his name expunged from the roll three years later as he became a figure of controversy for his pro-German stance during World War I. The expunging was later rescinded in 1920 after Meyer’s death. Email “Aung San Suu Kyi is one step closer to having her Freedom of Dublin stripped”. 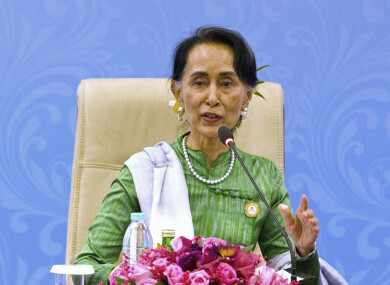 Feedback on “Aung San Suu Kyi is one step closer to having her Freedom of Dublin stripped”.